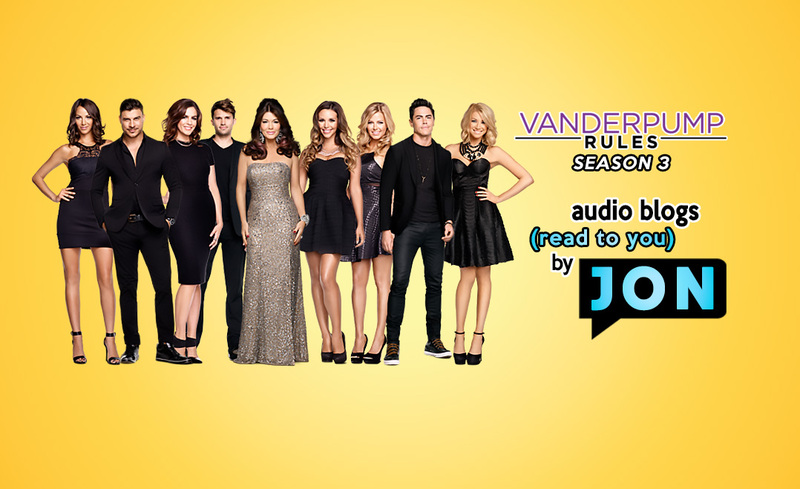 You are at:Home»Uncategorized»Vanderpump Rules Season 3, Week 4: Bravo #PumpRules Audio Blogs! Vanderpump Rules Season 3, Week 4: Bravo #PumpRules Audio Blogs! Listen the show right here, or download it from iTunes or Sticher from our PODCAST page. WEEK 4 November 25 2014: Hey all, it’s Jon! We are so excited to continue bringing you Bravo fans the blogs of the housewives and now Vanderpump Rules read to you by us! As many of you know we do comedic video recaps of your favorite Bravo shows weekly! In preparing for those shows I would read the Real Housewives blogs over on the Bravo TV website… the thing is it always took me forever! The pages took so long to load, were full of ads and well sometimes I just didn’t want anybody to see me reading them! I would get frustrated and recite my mantra, “I don’t read… I’m read to”! That’s when it hit me… I should create a podcast where I read the housewives blogs for you all! Plus I can comment here and there and put my comedic twist on them as I go. If you want EVEN more content from The Real Housewives, Game Of Crowns and MANY other Bravo shows then check out our BRAVO PAGE for vlogs, blogs, comedic recap shows and the bravo blogs of other shows read to you! This set of blogs (which I am reading to you) is about the employees of RHOBH Lisa Vanderpump’s restaurant SUR for the date listed above. There was a ton of drama and they all had a lot to say about it. I was shocked to find who I am relating the most to this week! Now this is the first time I am doing things this way so stick with me. I promise they will be faster and better as we go along. And of course I leave it up to you all to tell me if you love or hate this idea. If there something you want me to do more or less off please give me your feedback. After all I do this for you, and I want you to enjoy it. Also if you are listening in iTunes or Sticher please do me a favor and leave us a nice review and 5 stars. That really helps! Of course you can always make a donation via pay pal or become a patreon to get exclusive content and help support our shows. You can also start your online shopping by click on the Amazon ad in the side bar the holidays are coming fast so START NOW! You pay no more money and they continue to sponsor us. It’s thanks to your support and donations that we can keep providing you with all the content weekly and we are so grateful for your support. But ok, what are you waiting for? Go check out this new show and let me know what you think in the comments section below. Jon Richardson is an actor, comedian and professional host. He has been seen on Bravo TV show “LOL”, been a regular standup comedian at The World Famous Comedy Store in Los Angeles, CA. Currently he can be seen as a regular blogger/comedian at yourrealityrecaps.com covering reality shows and performing live all around the Seattle, WA and Los Angeles, CA areas.